Parents often ask what they can do to help minimize the “summer slide,” the effect of a lack of formal schooling in the summer, when students and parents tend to be more lax and children begin to lose what they learned the previous school year, that inevitably sets in every year. The best answer to this is to encourage your children to read every day. Set aside fifteen or twenty minutes each day for reading time. If your children are not reading on their own yet, read to them. 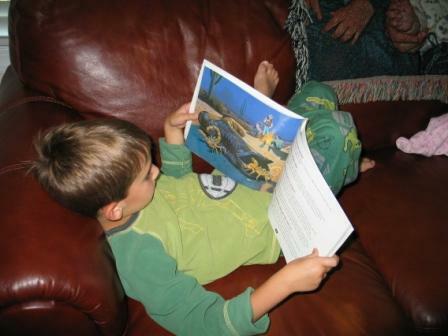 If your children are of reading age, provide choices for them and encourage them to read on their own. Borders and Barnes and Noble both offer a reading incentive that provides a free book at the end. Borders program is called “Double Dog Dare” and they are asking kids 12 and under to read 10 books by August 26th. Bring in the completed book list form to any Borders and receive a free book! Download a copy of the form from the link above. Barnes and Noble’s program is based on The 39 Clues series of books. Children in grades 1-6 are encouraged to read 8 books this summer and list them on their Passport to Summer Reading (download it from the link above). Children have until September 7 to complete their passport and return it to any Barnes and Noble to receive their free book. Parents can also download fun activities for children at the Barnes and Noble link above. Scholastic is also offering a summer reading challenge. Children are asked to read books and log the number of minutes they read. When kids log their reading minutes, they help their schools as they participate in the Read for the World Record Challenge! The Top 20 schools with the most reading minutes will appear in the “Scholastic Book of World Records” 2011 edition. Children ages 7 and up are encouraged to participate. The KidsPost is offering it’s Tenth Annual Summer Book Club for young readers. This year’s choices include books by “blockbuster authors” such as Rick Riordan, Ann M. Martin, and John Grisham. Most of the books are available at the library and each Wednesday, the KidsPost will review that week’s book and offer similar books that a reader may enjoy.